April Craft Challenge – make something that includes a kitchen utensil. Just in case you are new and this is the first you are hearing about this, here’s the scoop. On the Third Monday of every month, Amelia, (she blogs over at You Can Always Start Now) and I do a project or post based on one chosen DIY craft or theme, then we share our results and hopefully have inspired you to join our challenge. This month was a bit of a challenge for me as I wanted to try to do something really different and unique but in the end I made something using an item that was destined for Goodwill (an old box cheese grater). This item also turned out to be something I actually needed and use daily. I had left over spray paint from another project and on the warmest day we had thus far – (it was +5), I took my grater and spray paint and went to the great outdoors (ok my patio and only a few steps from the door, but it was still outside lol). Once it was dry I only spent about 15 minutes hanging some of my favorite pieces of jewelry(the jewelry I wear most often) on my repurposed box cheese grater. Amelia from You Can Always Start Now was very creative with some kitchen cutlery. Be sure to check out her post. 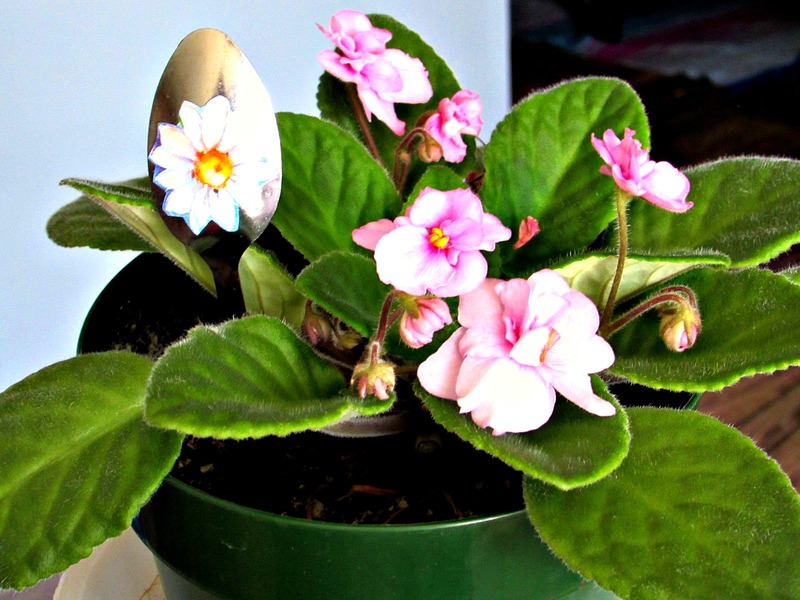 Can you see the spoon among the violets? Amelia picked up some spoons at the Dollar Store and used some wrapping paper that had some flowers on it. 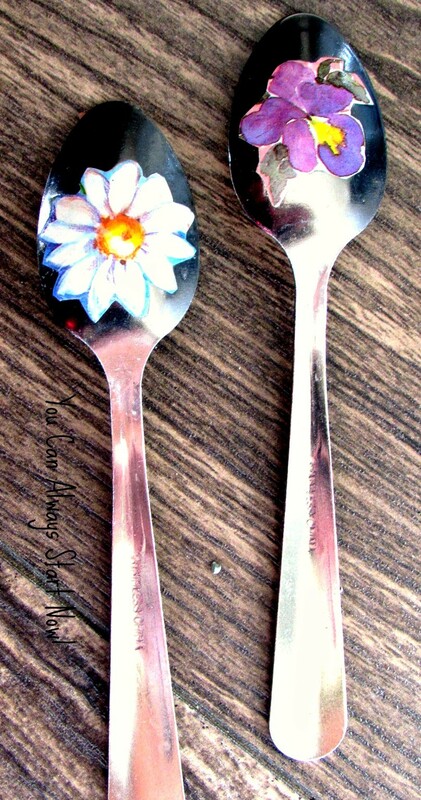 She cut out the flowers and used shellac to adhere them to the spoons. 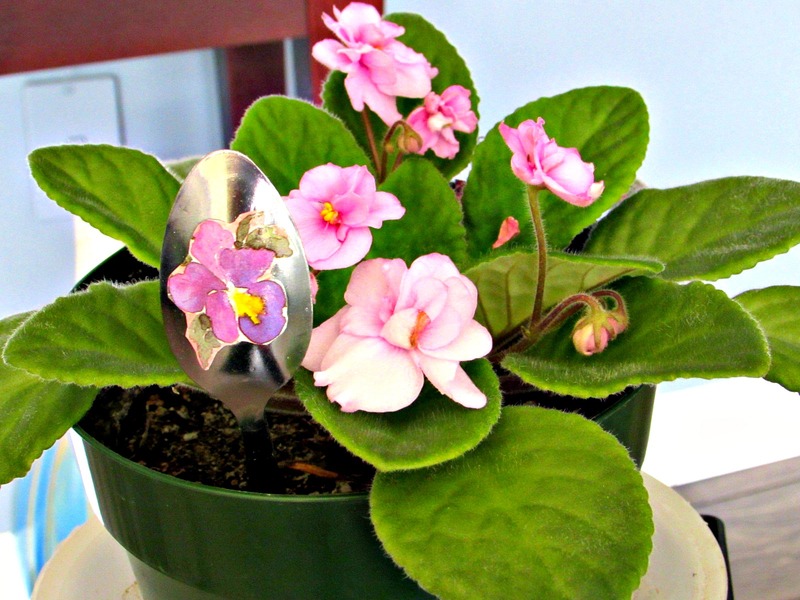 It was a quick and easy craft, a little bling for her plants. This idea could be adapted in a variety of ways and would look great in a vase by themselves or they could be used as markers in the garden. Be sure to Mark Your Calendar for May as we will be crafting using a picture frame. This entry was posted in DIY, Make and tagged challenge, cheap, cheese grater, creativity, DIY, easy, friend, monthly, plant, recycle, repurpose, reuse, simple, spoon, violet. Bookmark the permalink. Great idea and practical. Love the color. Hi Wanda! We started following each other on Twitter (Thank you!) and now I’m here on your blog enjoying your latest party! 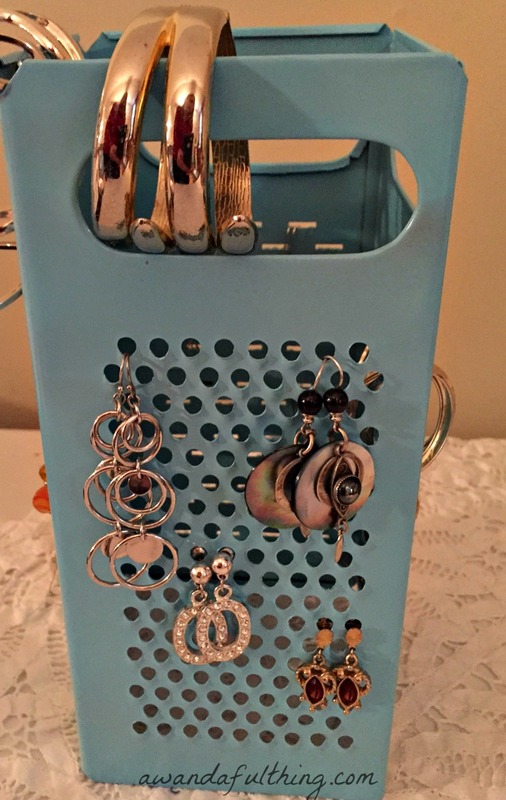 Your cheese grater turned jewelry holder looks adorable! It also looks antique and a prized possession! Wow! Love the monthly challenge themes! Hope to stop by next month and join in! Gail you are a woman after my own heart, I’ve subscribed to your blog and was just looking at some of your gorgeous projects…The coiled sisal rope basket just went on my to do list 🙂 Would love to have you join us on our monthly craft challenge.